Q: How does the wild boar hunt work? A: It is very challenging! Only the boars that you own are in the bush which ensures the most difficult degree of challenge. There are other natural wildlife as well, pheasants, grouse, deer, rabbits, etc. The most common way of hunting wild boar is stalking. It is the most challenging and exciting. Occasionally you hear the boars before you can see them. Sometimes one stumbles on fresh tracks and tries to follow . Tracking sometimes works even in the summer. Quiet stalking with keen ears and eyes is the most effective way of hunting wild boar. Q: How long are the hunts? A: Hunts are one day events. Two day hunts are available for groups larger than six hunters, upon request. The hunt usually lasts, on average, a good 3 to 5 hours of stalking (i.e. a great way to loose some extra pounds with exercise!) We do have tracking assistance available to help shorten the 'workout' if one didn't want to do as much walking (requested very often). Q: Can I come from the States to hunt on your reserve? A: Yes, we get a fair number of hunters traveling from different parts of USA (Hi Thomas in Nevada!). Hunters may bring their own long firearms and archery into CANADA for hunting. Taking the meat back across the border into the States with you is OK, too. It is very quick and easy. We'll give you details before making your reservations. 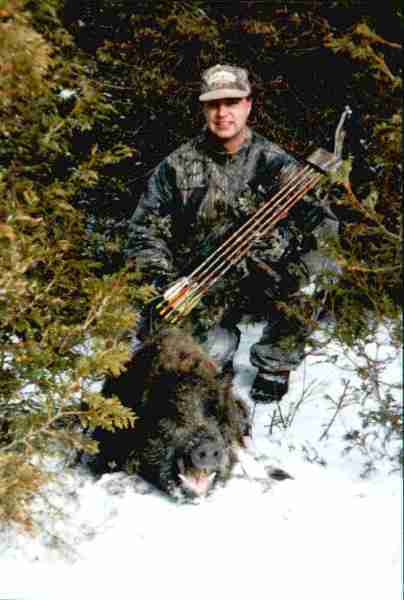 Our hunters, whether they were local, from the States, or other parts of the world, have been very pleased with the quality of our boars and with the challenge of our hunts (see Reference page). Q: What happens if I just can't get the wild boar? A: Have faith in yourself! But, should you feel you may require assistance, WildBoar Reserve allows second day of hunting when required. Q: Is camo required for the hunt? A: Camo may be used, but it is not absolutely necessary. It has some benefits (see Tasha in the calendar, month of October. Hi Tasha!) with particularly difficult hunts, a great benefit for archery hunters. Q: When is the best time to hunt wild boar? A: Hunting for the challenge and meat is very good all year round. Trophy boar hunters should consider hunts between approximately November until about April when the wild boar have their extra thick coats of fur covering them. Hunting is most challenging from July through to October due to the strong natural cover (leaves, four foot tall grass along the picturesque riverbank, etc.). Snow makes tracking very interesting in the winter and it creates an atmosphere that truly fits the occasion. The bush consists of cedar and pine trees as well, so winter still provides lots of cover for both the hunter and boar. In general, wild boar are very smart so stalking these keen beasts can put any great hunter into a spin. Q: What size gun can I use? A: For rifle, shotgun, archery, or muzzle loader information, see our Hunting page. Q: Do you have a minimum age for a hunter? Q: Do I need a license to hunt wild boar at WildBoar Reserve? A: You do not need a license to hunt wild boar at WildBoar Reserve. Game tags are not required. You should be familiar with the weapon you are using. Q: How safe is wild boar hunting? - Younger/smaller wild boars are as safe as deer hunting and can be recommended to even a beginner hunter. - Older/bigger wild boars are getting more challenging and they can hurt a hunter more seriously if in a mood to charge. 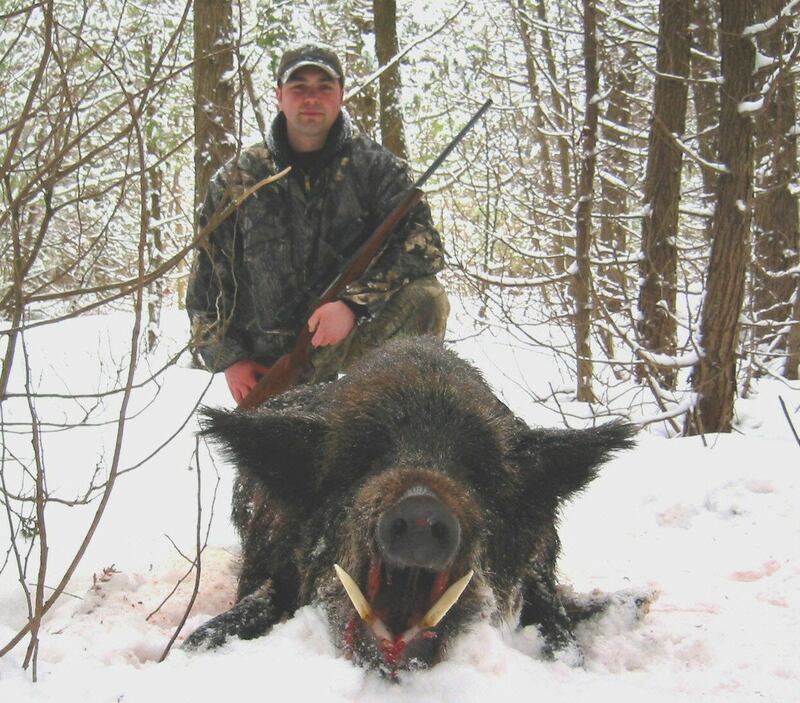 Experienced hunters find hunting of this size wild boar very challenging and exciting. - Big trophy boars with large tusks can be deadly and are to be hunted by an experienced hunter with a lot of respect and caution (Team 1Emergency Services Unit excelled - especially Emerson. Hi Scott!) . A guide or backup partner should be close by. We have had no hunting injuries by a charging boar thus far, and we are committed to doing our best to continue the safe hunting of wild boar. A: The basic price buys you a wild boar of your own, the hunting of it is free for you. Field dressing is a must but the rest is up to you if you would like additional services. Q: What are the arrangements for butchering? A: We will skin and field dress your catch, right away, at our clean facilities. Cutting, wrapping, smoking, freezing, etc. may be done in a nearby abattoir experienced in wild boar. We will make the arrangements, if you would like your meat packaged (vacuum packed) and it can be frozen too. Q: Are there accommodations available? A: Yes, a few Bed and Breakfast's are nearby which we recommend as well as the Homestead Resort with private log cabins and motels are also available. All include a hearty breakfast. Prices are very reasonable and dinner may also be included in a package price at the Homestead.